When considering oral calcium supplements to help maintain normal blood calcium concentrations, it is critical to have a form that will be absorbed quickly enough to raise blood calcium to counteract the hypocalcemia that occurs in most cows at freshening. Both the calcium chloride and the calcium propionate in Transition boluses are very soluble in water, providing calcium ions that will be quickly absorbed across the rumen wall within 3 hours following administration. Calcium carbonate is poorly soluble in water- it only becomes available for absorption after reaching the hydrochloric acid within the abomasum. It can supply calcium for absorption in the small intestine over the next 16-36 hrs. Figure 1 demonstrates how calcium chloride and calcium propionate, but not calcium carbonate can increase blood calcium within a few hours of administration. It is also important to use a bolus that is coated with fat to lubricate the passage of the bolus down the esophagus. Calcium chloride: Offers a potent immediate release, but levels drop over time. Calcium carbonate: Offers a low immediate release, but calcium levels increase over time. 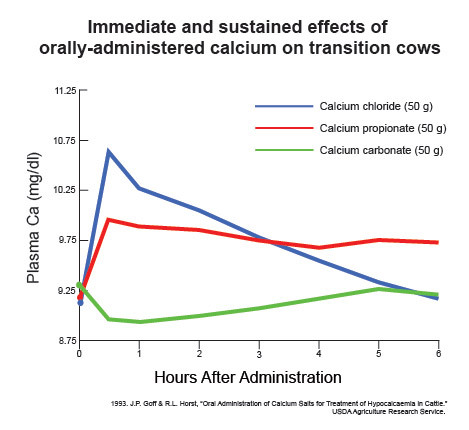 This is how TRANSITION™ Boluses are able to deliver more available calcium than other sources – transition cows receive calcium that goes to work immediately upon release and sustains its performance over a long period of time.